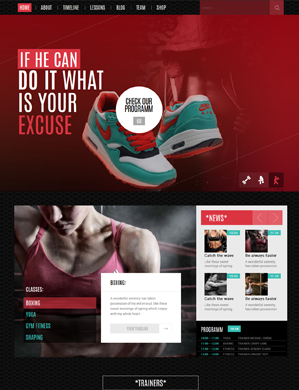 Sportify is compatible with WooCommerce. It includes a wide set of eCommerce features allowing you to: manage your products, orders, customers, inventory, shipping settings, and much more, all created to help you easily sell your products or services. The design fits ideally and looks great on a wide range of devices and screen resolutions. This means that the layout will adjust and look accordingly on all desktop computers, laptops, smartphones or tablets. Dedicated area in your WordPress admin where you can easily add new predefined elements (Services, Testimonials, Team Members, Calendar, etc.). All posts are customizable and are tailored to the design of the layout. The most popular social sharing services integrated: Facebook, Twitter, Google+, Pinterest and more. A useful feature that allows users to send their messages instantly, without reloading the webpage. This makes the contact form a prompt and useful channel for feedback. The most popular service to represent your geographical location integrated. Simply type in your location name, preview the map, select a custom icon and save the data.